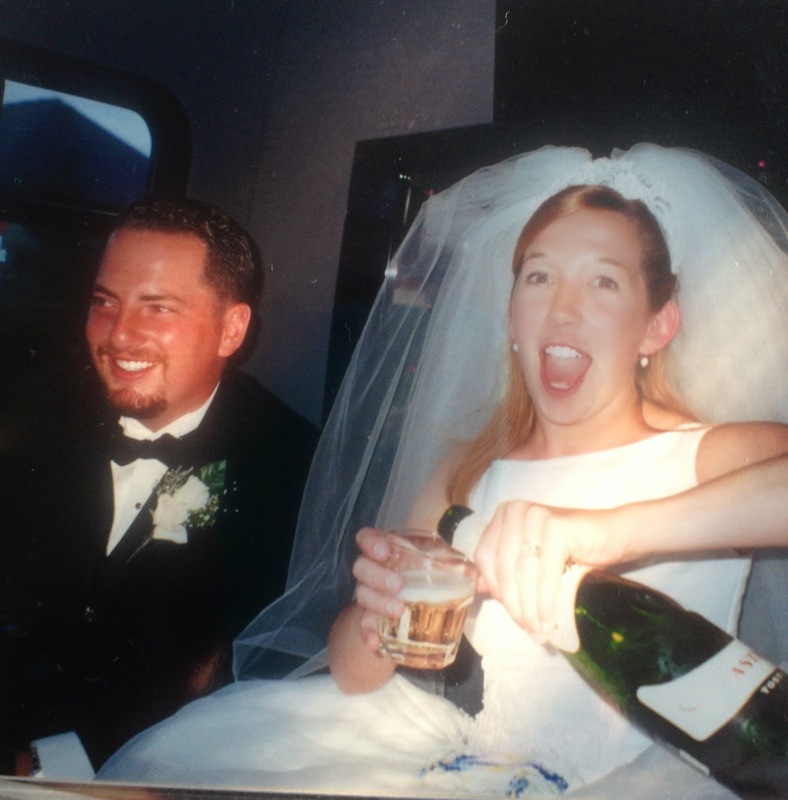 Fourteen years of marriage. I can't even wrap my head around how that's possible. How has it been so long? How are we that old? I mean, come on. Life is kind of crazy like that, it's all blink of an eye, while you're making other plans, it's happening. Lucy took this picture of us this past weekend. We were talking about how we so needed our recent family vacation to reconnect and make memories together. I love seeing us being natural/happy/in love through her eyes. I so wish I had captured moments like this between my parents. 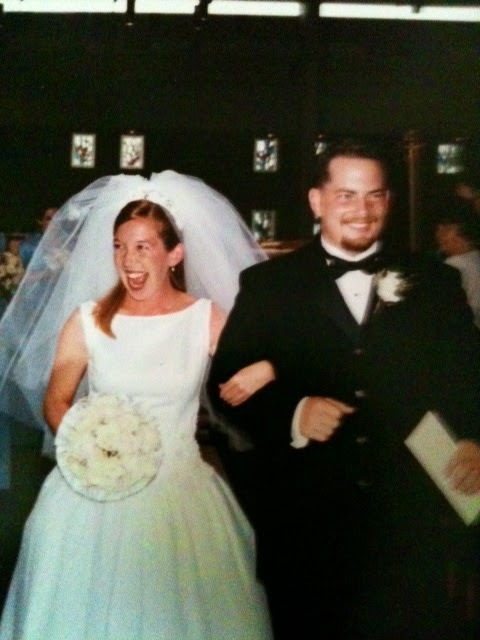 Fourteen years ago today, I married Tim. We had no idea what were doing. We were very into the right now, not the long term. I was worried about wedding dress details and he was worried about getting through the ceremony with his severe hangover from partying with his friends and brothers the night before. 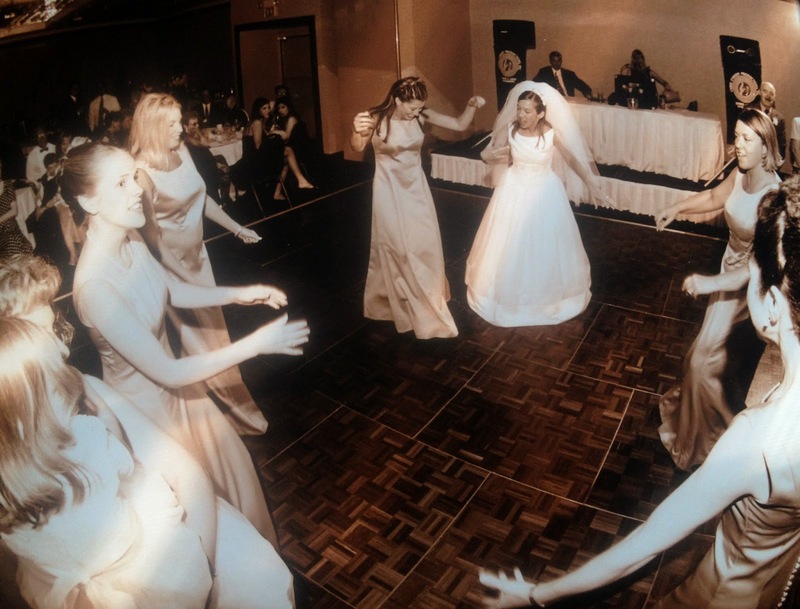 We laughed our way through the ceremony and I danced the night away at our reception. It was all wonderful and fun and funny. "Make sure you enjoy it," several people advised me about the wedding. "It goes by so fast, it's a blur and you don't want to forget it, enjoy it." That was the single best piece of wedding-day advice I got from anybody. The day was a blur of family members and activity. I felt like a politician holding babies, hugging old ladies and smiling at everyone. But in all the happy chaos, I remembered the advice. I remembered to look around several times and take it all in, storing it away in the "You Must Remember This" file in my mind. My littlest brother who was the ring bearer dancing with his mom, who was married to my dad at the time (they aren't married anymore and my littlest brother is all grown up). Laughing with my cousin whose feet hurt because she was dancing and so very pregnant with her first child (who is now a teenager! whaaat?). Oh my gosh, that's my little brother/ring bearer who is all grown up now. I filed away the fact that these people would never be together in a room again...my uncles and aunts who drove/flew in from everywhere, my step-relatives, Tim's grandfather, our friends. 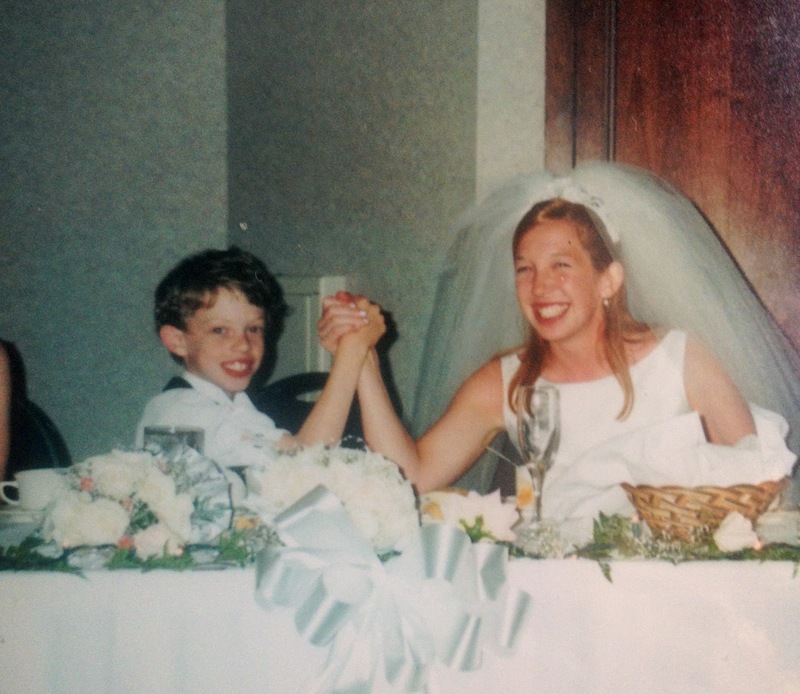 Over the past 14 years, I have remembered the wedding advice and sort of made it my marriage/parenting/life advice. There have been so many more moments stored away in the "You Must Remember This" file it's overflowing. But my god, those people were right--it goes by so fast, it's a blur and you don't want to forget it, enjoy it. We are not skipping through life holding hands and remembering our perfectly perfect happy life. Nope. We are raising a family, paying bills, making mistakes every day. We are growing up together and learning to change with each other. We still have no idea what we are doing, but we've been through things and when you go through things together, when your "You Must Remember This" file is overflowing with happy things and hard things and sad things and important things that have happened to both of you, it can make you stronger and more in love. A deeper love that we are celebrating, enjoying and never want to forget. Happy anniversary! I love real post about marriage! oh you guys are freaking adorable. why aren't you my neighbor again? I got that advice too and I adore that you have kept it in mind during your marriage as well. Happy Anniversary!! Happy anniversary! You two are adorable. I love the story of how you met. You two are so adorable!! I love reading about your marriage (is that weird?) and I love that Tim made his vlog debut! So cute! I hope you had a fantastic, love-filled, smooshy and smoochy anniversary. I love this post. You've hit it right on the head: file these moments away, because they are the last time they're going to happen just like this. Love that advice. Happy 14th!